Right now we’re in northern Italy in a small city called Rovereto, approximately 70 kilometers north of Verona. 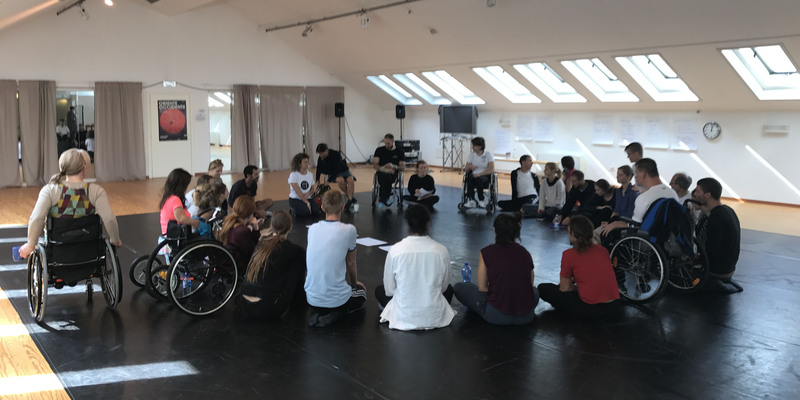 The reason we’re here is to take part in Rovereto Choreographic Lab, which is part of the EU project Moving Beyond Inclusion. The project started during autumn 2016 with the lab that we hosted in Uddevalla. With Moving beyond Inclusion, we want to display diversity and create equal opportunities for everybody in practicing the art of dance. Because we believe in and are willing to fight for everybody’s equal right to express themselves artistically, regardless of physical, mental or other obstacles. The project is about creating a supporting network of companies, artists and programmers. In a long-term perspective it is also about broadening the European work force and the artistic work. At the core it’s about the development of professional performing arts both in terms of dancers, choreographers and audiences. For us in Spinn it’s about the right to express ourselves artistically and to be able to create high quality art. But there’s also a democratic perspective: we can’t have a society that actively shuts out people just because they have a disability. If we don’t have the right tools to “take care” of certain people and their unique needs, then we just have to create new tools right? Joanne Lyons who work for Candoco Dance Company who is the lead part for the project, has written a great article about what we do within the framework for this project and why we do it. The article in its entirety can be found here.. Here you can also see a short film about Moving Beyond Inclusion, shot on location during Uddevalla Choreographic Lab, autumn 2016. Read more about Moving Beyond Inclusion and about upcoming activities here..